My home theater speakers are finally connected. We tested the speakers by playing Lord of the Rings: Return of the King. With the 5.1 digital surround sound, home entertainment is a totally different experience! The subwoofer was powerful enough to rattle the walls! Heheh. Good thing it is winter and all the doors and windows of the house are closed and so are the neighbour's! And good thing we don't live that close to each other! 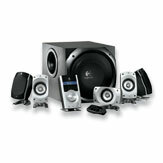 I bought the Logitech Z-5500 speakers. I decided on this because the price was right and the reviews were very encouraging. Most people would use these speakers for their pc, but the speakers are powerful enough for home entertainment. I still can't get the speakers to work with my microphones plugged into the karaoke player though. I did the setup thing for the mic with the karaoke player but still nothing. :-( So karaoke will have to wait till Doug and I can figure this out. For those who like to watch movies at home, go get yourself a set of home theater speakers. Movie watching at home will never be the same again! Good idea on the Logitech. Lower cost for movie, but maybe not for karaoke. Uk, ya, not sure about using the speakers for karaoke .. we'll see coz they have not been tested yet. Cathess, nila meh tua bepekit belagu karaoke! Heheh, lagu melayu enda meh aku tu nemu .. belajar belagu Bujang Lelingai, ila tua tau beduet! Wow! Sounds like you got it good. I have altec lensing VS4121 and it works like magic, considering the cheap price of rm 230. I test it with all three LOTR movies and got blown away all the same. Too bad I live in an apartment block. Otherwise I'll have a blast 24/7 with dvd and MTV. Computer speaker systems these days work as well as home theater systems, or better since they cost less. But a Yamaha home theater system is still on my wishlist. Agus, that's the thing about living so close to each other! You can't even enjoy your home theater to its max! My place is not too bad. We live on a 2 acre property so plenty of space to do your own thing! I love my new home theater speakers!